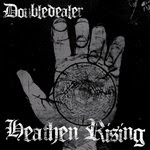 Heathen Rising, the new record by Doubledealer, is up for free listen at band's bandcamp. The 7" ep will be released by Get This Right Records. Check the new songs here!